India is a country of tradition and culture, and agriculture has always played an integral part in both. Agriculture is often referred to as the backbone of our country. However, historically and scientifically speaking, agriculture marked the beginning of human civilization and human brain development and is one of our oldest professions (if not the most important). For the past few decades or so, agriculture in India has been going from bad to worse in terms of quality, and as a business prospect. Dependence on traditional or inadequate equipment has lead to crop failures and loss. It is said that today, in India, the farmer’s child is no longer encouraged to follow the family business. And this is a scary thought when we depend on them to survive. It’s 2018! And today, a new breed of farmer is born. Hydroponics, a technology that enables farmers to grow in sterile environments using water, has changed the image of a farmer entirely. From engineers and newly graduated youngsters to large corporates and businessmen who may have never even gardened a day in their lives, farming is now moving into the mainstream. Cleared land of a minimum half acre. Access to water and electricity. Apart from this, one would need to decide which variety of plants one would like to specialize in. Based on current trends, leafy greens and herbs appear to be the best way to start. FutureFarms has set up close to 40 of these farms in the country in a matter of two years, and these farmers appear to be enjoying immense success in both growth and revenues. These plants grow on Nft (nutrient film technique) hydroponic systems. NFT systems like the FutureFarms Leaf Station Farms (LSF), allow the farmer to grow leafy greens and herbs in three times less space (compared to soil. The success of the business almost entirely depends on the quality of equipment used and the choice of vendor. Within the plant group, you have chosen to grow, the next step is to decide the crop mix. If you plan to sell to a B2B (business to business) market, high volumes are required at bulk rates. This would mean that the priority of the farmer here would be to focus on a small variety of crops, in larger volumes. The idea here is to get contracts with major aggregators or bulk consumers at lower margins, but assured sales for the period of the contract. If you plan to be more of a brand or directly target consumers, the variety is key. In this strategy, you would not be looking at build sales with lower margins, but rather lower volumes with higher margins. Having a good portfolio of products, in this case, would be the key to target the end consumer. Whether you take the plunge or not, hydroponics is here to stay and is certainly the future of farming in India. How to Choose the Hydroponics Suppliers? 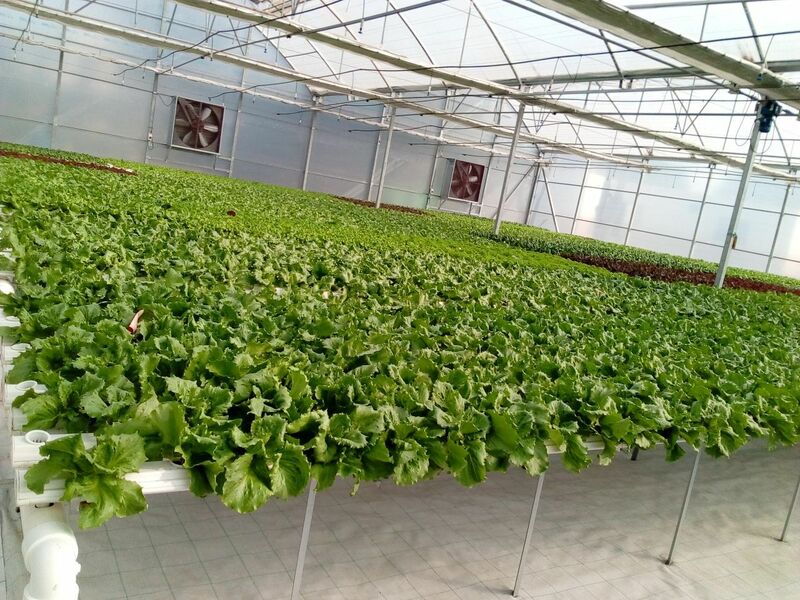 Hydroponics in India is a very new industry and hence, finding good hydroponics suppliers is more difficult than would be expected. This article is a short guide to helping you pick a good hydroponics supplier to get you started with growing plants at home. The first thing you should do is to categorize existing suppliers into equipment manufacturers vs. re-sellers of popular brands. This is important because if the re-sellers are selling you systems designed and manufactured internationally, then in case of damages or replacements you will face delays in replacing parts. This is a problem if you are mid-cycle, you now risk losing your plants. In case of equipment manufacturers, the procurement of spares or replacements will be significantly easier. Hydroponic systems are not prone to heavy wear and tear, but over time in case of incidental damages to the system can cause leaks that may be hard to fix – making it more advisable to go about picking a local manufacturer that helps with spares and replacements. The next important consideration when practicing home hydroponics is looking for NFT Hydroponics system suppliers that who also provide post-sales service. Home hydroponics for a beginner can be quite daunting, it would help if you have someone to guide you through your first grow. Some hydroponics supplier also offers training programs or paid visits to help you get started. The next important point when picking hydroponics suppliers is to understand what certifications the supplier has for their equipment. This is important because all the materials used in hydroponics should be food grade while buying hydroponics equipment please note that the materials used have food grade material certifications. These certifications are expensive so this reflects in the cost of the system. So opting for the cheapest system is not the best option as the low price may be a result of not using food grade materials so do look out for the same. Some suppliers may offer you DIY kits that are a compilation of different parts required to build a system this option may be cheaper and offer some customization options but will require one to assemble the system yourself. Inputs are another important consideration, good quality consumables like seeds and nutrients are hard to come by picking a supplier who offers both is a good idea as they will have some experience in growing the seeds and their inputs will be valuable as you are getting started home hydroponics. 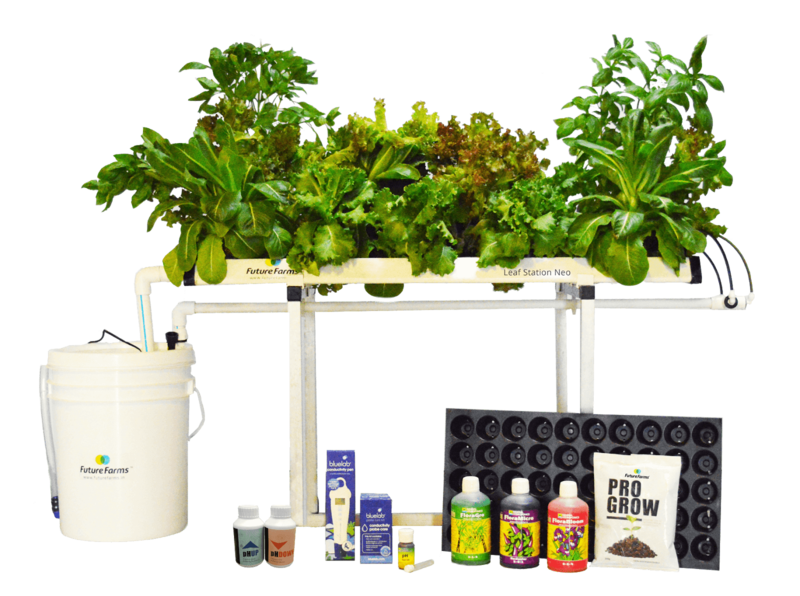 Best way to get started is to look for suppliers that offer complete growers kits for home hydroponics this will help you get all the required components in one go. 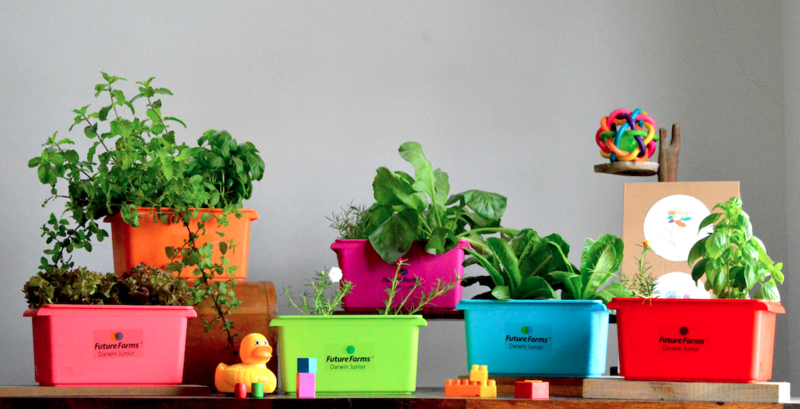 So what are you waiting for, go to www.futurefarms.store! Hydroponics by definition does not use any soil, soil which has traditionally been one of the core components of farming/gardening was the best format for nutrient delivery. The soil plays 2 important functions, the first it breaks down the fertilizing agents so that the plant can absorb the same via its roots, second, it also supports the plants so that they can stand upright. Hydroponics omits the use of soil altogether. They instead use different media for different purposes, techniques, systems etc. A “medium” refers to the substance that is used to replace the soil and provide support to the plant. This medium can be made from different materials, either man made of synthetic in nature. Coco peat is a natural material that is made using crushed coconut, it has very high wicking ability and water retention property thus allowing it to retain a significant amount of water this allows the root zone to be kept cool in hot climate zones. Another example is rock wool which is a man-made material that. It’s created from rocks that have been melted and spun until it’s become fiber much like fiberglass. They are fashioned into cube-like shapes and are preferred in commercial farming as they can be used directly from the seeding stage and no transplanting is required thus reducing the labor required. 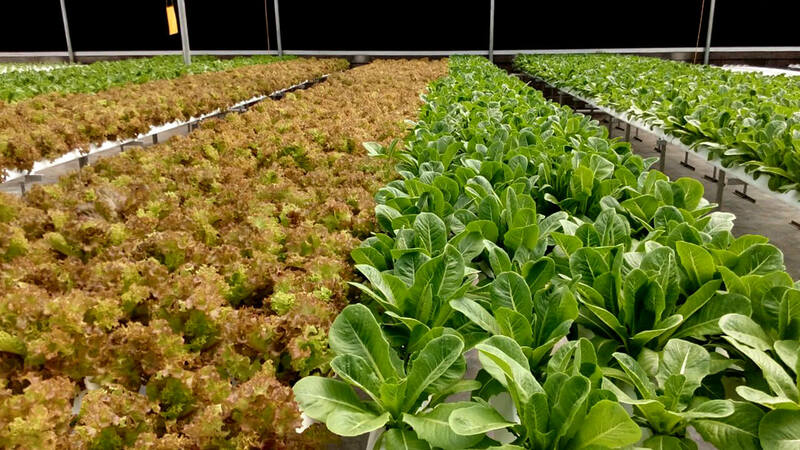 The ultimately the choice of media for NFT hydroponic systems is one that has a high wicking ability and is easily available for large-scale consumption as this is essential for commercial hydroponic farming. Some of the most popular choices for mediums are as follows. LECA or lightly expanded clay aggregate these are clay balls that are very light, nontoxic and infinitely reusable. This is preferred by a commercial farming as unlike a lot of other media options this one is reusable, hence this is good for commercial farming. Rockwool is another popular medium choice, the advantage is that they come in slabs and are very easy to work with, they can be seeded very easily and the same plug can be used right from the nursery till harvest, eliminating the need for transplanting. The drawback with rock wool is that it is not reusable and they are not biodegradable this is a concern for some growers, the plugs are also expensive and in some cases may increase the cost of production. Cocopeat is a low-cost option that can be used, they have superior wicking ability and great water retention ability this helps cool plants while growing in higher temperature zones. Other options included sand, perlite, vermiculite etc there are so many grow mediums to choose from, each with their own unique characteristics. Choosing the right to grow medium can make the difference between success and failure in the commercial farming. While making the right choice for you, always look for consistent supply, low cost and wicking ability, retention ability and aeration. The first step to setting up your first hydroponic garden is selecting a system that best fits your needs. Important factors to consider include: how much space you have, what you want to grow and how much, cost, and how much available time you have to spend maintaining the system. These systems can be built from individual components which would require an understanding of hydroponic system design and have the components purchased separately, or you can buy a complete setup kit from online retailers or in a hydroponics store. Places like Bangalore, with limited spaces in Urban areas, are ideal for the adoption of Hydroponics! Hydroponics in Bangalore would be beneficial due to the productivity that’s now available from within homes or offices. Just about any plant can be grown hydroponically, but for beginners, it is best to start small. The best choices are herbs and vegetables that grow quickly, require little maintenance, and do not need a broad range of nutrients. Fast-growing plants are best since they make it easy to assess how well your system works and tweak it as necessary. It can be a real letdown to wait months until harvest time only to find out your system is not working properly. Maintenance-free plants are great for beginners because they allow you to focus on learning about your system—you can move on to more complex vegetables later. If you are growing a variety of plants, it is also important to make sure that they are similar in their nutrient requirements, so that they grow well together. These plants would work best in NFT Hydroponic systems! To get started, you can look to invest in a reasonably priced but good quality NFT Hydroponic system. These kinds of Hydroponics systems can be purchased online in Bangalore from quality retailers like FutureFarms. Another option for a beginner would be to build your own Hydroponic system. When you build your own hydroponic systems, you are creating a new environment for our plants to live in. Without understanding what a plant needs to survive and hydroponic system design, it will be hard for you to grow strong and healthy plants. You’d also have hard time troubleshooting problems that arise in your homemade hydroponics system. It’s important to know all of the different variables that go into your system. This way, you can figure out how to optimize them and have everything work in harmony. A well-designed system is definitely a beautiful thing to see…everything runs automatically, creating a utopia for your plants! The pH levels in hydroponic systems can often be overlooked if a grower is focusing more on monitoring a solution’s electrical conductivity or TDS level, balancing nutrients, providing beneficial additives and avoiding algae and plant pathogen problems. Today, we’re going to be focusing primarily on pH. pH is the measure of acidity or alkalinity of an aqueous solution. If a solution is acidic then it has a pH in the range of 0 to 6.9. If a solution is alkaline then it has a pH in the range of 7.1 to 14. Pure water or deionized water is neutral at pH 7.0. The ideal pH for most hydroponic systems application is between 5.8 and 6.2, except for Rockwool cultivation, which likes a slightly lower pH of about 5.5. We are going to be focusing on the importance of pH in NFT Hydroponic systems. If the pH of a solution is not within the correct range the plant will not have the ability to absorb some of the essential elements required for proper plant growth. There are a few ways to check the pH of your nutrient solution, such as paper test strips, liquid pH test kits, and digital pH meters. We would highly recommend Bluelab if you were looking for digital pH instruments. We prioritize Hydroponic technology in India and the various Hydroponic kits that we sell in Chennai, where we’re based, and all over India have pH testing solutions included. 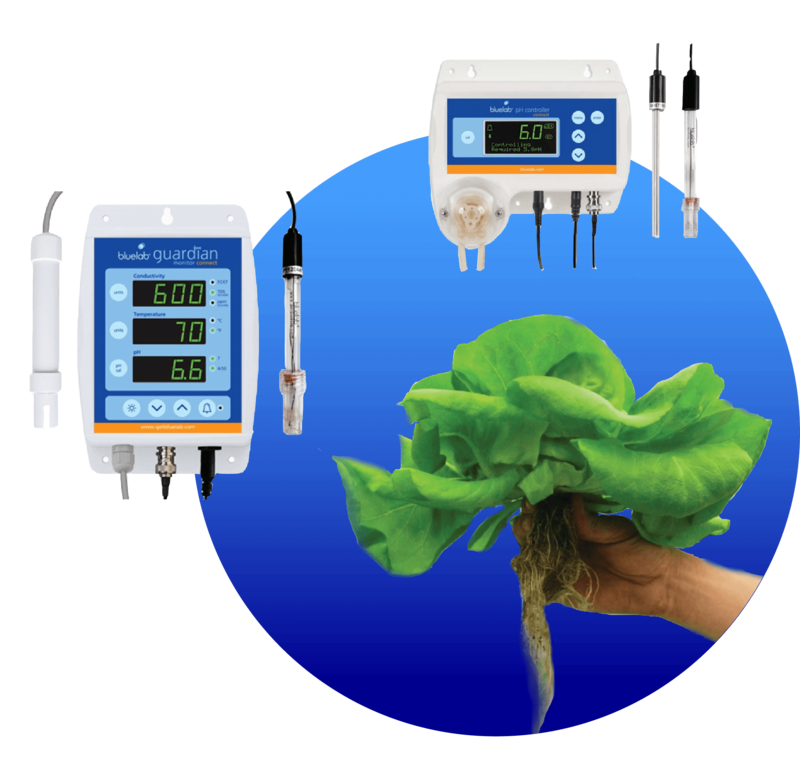 Automatic pH pens and meters are the most accurate for your hydroponic system, when calibrated correctly and offer continuous monitoring often with the possibility of data logging and taking into account temperature fluctuations, which can affect the calculation of pH levels.